(Nanowerk News) ATLASGAL is a survey of the Galactic Plane at a wavelength of 0.87 mm. It has revealed an unprecedented number of cold dense clumps of gas and dust as the cradles of massive stars, thus providing a complete view of their birthplaces in the Milky Way. Based on this census, an international team of scientists led by Timea Csengeri from the Max Planck Institute for Radio Astronomy in Bonn has estimated the time scale for these nurseries to grow stars ("The ATLASGAL survey: a catalog of dust condensations in the Galactic plane"). This has been found to be a very fast process: with only 75,000 years on average it is much shorter than the corresponding time scales typically found for nurseries of lower mass stars. Stars significantly more massive than the Sun end their fast and furious lives in violent supernova explosions producing the heavy elements in the Universe. Throughout their lives, their powerful stellar winds and high-energy radiation shape their local environments and have a significant impact on the appearance and future evolution of their host galaxies. These stars form at the densest and coldest places in the Milky Way deeply embedded in dust cocoons, which are so dense that they absorb most of the radiation from the young stars within. It is in these dense cocoons of gas and dust, hidden from visible and infrared wavelengths, where the next generation of stars are being born. An international team of astronomers used the APEX telescope with its sub-millimeter camera, LABOCA, built at the Max Planck Institute for Radio Astronomy (MPIfR), to survey the inner Galaxy to search for the birthplaces of the most massive stars currently forming in the Milky Way. The APEX telescope is located on the Chajnantor Plateau in Chile at 5100 m altitude, which is one of the few places on Earth where observations at sub-millimeter wavelengths are possible. The ATLASGAL survey covers more than 420 square degrees of the Galactic plane, which corresponds to 97% of the inner Galaxy within the Solar circle. Thus it includes large sections of all four spiral arms, and approximately two thirds of the entire molecular disc of the Milky Way (see lower right inset of Fig. 1). This data set therefore includes the majority of all massive star forming nurseries in the Galaxy and is being used to construct a 3D map of the Milky Way. The APEX Telescope Large Area Survey of the Galaxy (ATLASGAL) provides an unprecedented census of the cold and dense environments where the most massive stars in our Galaxy begin their lives. The material in these stellar nurseries is so dense that optical and infrared light emitted from the embedded young high-mass stars cannot escape. Therefore, the earliest stages of star formation are effectively hidden at these short wavelengths and longer wavelengths are required to probe these regions. The ATLASGAL survey detects emission at sub-millimeter wavelengths, which is dominated by emission from cold dust. It provides a detailed view of the birthplaces where the next generation of massive stars is being formed. As these dusty corners of our Galaxy are very difficult to access, such surveys provide the large scale coverage to search for the stellar nurseries forming the most massive stars in our Galaxy. 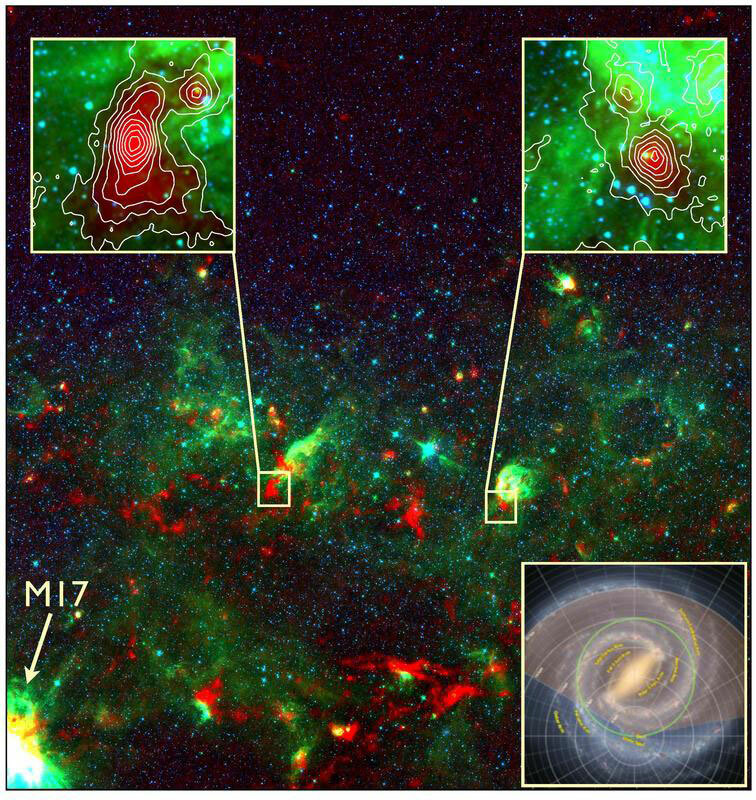 “Our team has now analyzed this survey revealing the largest sample of the so-far hidden places of massive star-formation”, states Timea Csengeri from MPIfR, the lead author of the study. "We have identified many new potential sites where the most massive stars currently form in our Galaxy." Providing an unprecedented statistics, scientists reveal that the processes to build up the cold, dense sites where the most massive stars in our Galaxy form, occur rapidly, taking place within only 75,000 years, which is much shorter than the corresponding timescales in nurseries of lower mass –stars like our Sun. 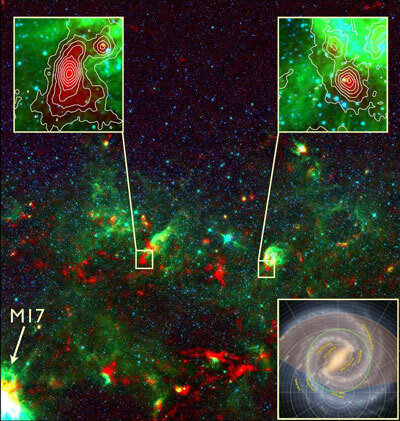 This is the first global indication that star-formation is a fast process in our Galaxy. "We characterized these places to search for signatures revealing how massive stars form within them," continues James Urquhart, also from MPIfR. “The fast and furious life of the most massive stars was already known. And now we could also show that it is initiated by a pretty short infancy within their stellar cocoons.” The lifetime of massive stars is about 1000 times shorter than the lifetime of stars like the Sun, and the new results reveal that they also form on short timescales and in a much more dynamic star formation process. “Only telescopes at exceptional locations, such as the high and dry Chajnantor Plateau in Chile at 5100 m are capable to observe in this frequency range”, adds Frederic Schuller from ESO, co-author of the study. “This is the largest area in the sky surveyed from a ground-based telescope in the sub-millimeter wavelength regime". “ATLASGAL also provides a “finding chart” for the most extreme dust cocoons, where the innermost processes of stellar birth can be studied at much higher angular-resolution with the new ALMA interferometer, located just next to the APEX telescope” concludes Friedrich Wyrowski, the APEX project scientist at MPIfR.